Allegra is the middle sister between dewy-eyed Alice and wild child Edith (called Minnow). Allegra’s favorite place in the entire world is North Haven, an island off the coast of Maine where she and her family rent a cottage every summer. With 17 days of vacation left, Allegra’s parents find themselves called away from the island for a funeral, and they plan to send the three girls to stay with their aunt. Allegra, who just can’t bear being away from the island for a week, decides to tell a couple of lies in order to make it possible for her and her sisters to remain at North Haven alone. The plan goes off without a hitch - until the girls get home to find there is no food. What is supposed to be a relaxing time of freedom from parents and rules turns out to be a week of worries as Allegra struggles to keep her sisters well-fed, happy, and free from injury until their parents get home. This quick middle grade read by Anne Lindbergh (daughter of Charles and Anne Morrow Lindbergh) is a great choice for upper elementary beach reading. Any child who has ever had a vacation cut short, or who has lamented the end of a long visit to the beach will understand Allegra’s desire to deceive her parents and make the most of her time on her beloved island. The three girls’ extremely different personalities are a major source of conflict and excitement as the story progresses, and the plot really appeals to kids’ sense of adventure. Kids often imagine what their lives would be like if they were left unattended for even a short time, and this book explores the practical side of such an adventure, but also indulges kids’ curiosity about what that situation would really be like. Allegra is a wonderful narrator, whose voice is intelligent, funny, vaguely sarcastic, and brutally honest. Her views of her stranger sisters - Alice, who speaks almost exclusively in Shakespearean dialogue from Romeo and Juliet, and Minnow, who loses six pairs of underpants in just one week - say a lot about the relationships that exist between sisters and the reader is aware of how much the girls love each other, even when they don’t get along. As in Swallows and Amazons, there is danger in this book, but it’s never insurmountable, and even the worst emergency of the story doesn’t scare the reader. Rather, the reader is amused by these brave three girls who are able to live off the land for a full week without ever asking for assistance from adults. 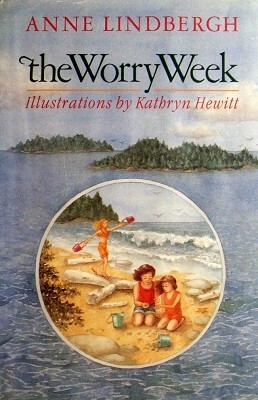 The Worry Week was published in 1985, but the only thing that truly dates the story itself is the lack of cell phones. A cell phone would have made it much easier for their parents to figure out what the girls had done and probably would have put an end to their island adventure that much sooner. The edition I borrowed from my local library also has absolutely atrocious illustrations that do not match the story and don’t even really look professional. I was utterly surprised that the book jacket calls the illustrations “lively.” Each one was more out of place and awkward than the next! The Worry Week compares well to The Sisters Club by Megan McDonald, Homecoming by Cynthia Voigt, and the Penderwicks series. Girls who like adventure, family stories, and happy endings, will find all three in this fun and well-written novel for grades 3 to 7. Thanks for the tip. I'll look for that edition! I'm fond of kids alone books, and this one sounds right up my alley! Thanks.